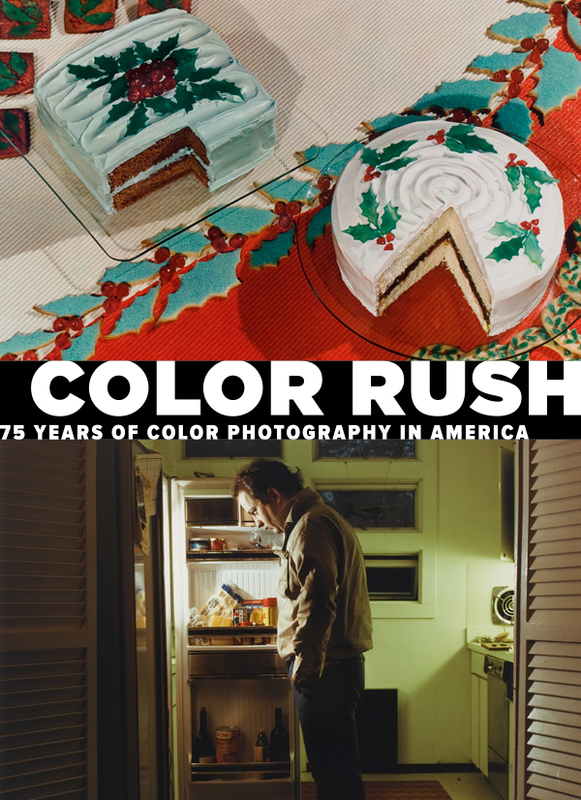 When the design team was tasked with developing the identity for Color Rush: 75 Years of Color Photography in America, a comprehensive exhibition charting the history of color photography in the United States from 1907 to 1981 and including nearly 200 objects, we knew we had our work cut out for us. 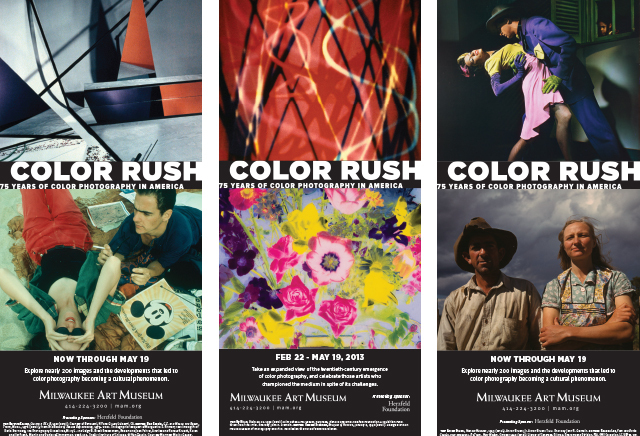 The work in Color Rush is robust, ranging from early experimentation to oversaturated mid-century advertisements to the conceptual thrust of the late 1970s. We wondered, how would we create a strong typographical mark that would encompass and speak for such a full and varied exhibition? In selecting a typeface for the logo, we were mindful of the vast histories represented in the show and knew we had a number of historical options to reference. However, it was the curatorial approach (the modern lens used by Lisa Hostetler and Katherine Bussard) that most informed our decision. We were searching for a typeface that could relate to the experience of a contemporary viewer looking back on the pivotal moments in the history of photography that brought us to where we are today. We eventually decided on Gotham, a typeface created by Hoefler & Frere Jones in 2000 and inspired by architectural signage in the Big Apple. While oft-used and a go-to typeface for many designers (it’s so ubiquitous it’s practically a household name), it seemed an appropriate choice for the subject matter we were tackling. We wanted something that felt familiar but also jarring, punchy, and, ultimately, American. It also helps that it was the typeface of choice in President Obama’s “Hope” campaign of 2008. In creating a logo-type for an exhibition, it’s important to come up with a solution that is simple and supplementary to the show as a whole while managing to give a viewer key clues about what the show is about when used on its own. Knowing that the title already covers two of the shows most prominent ideas (“color” and “rush”), we were careful not to overemphasize these characteristics, especially since these words are so evocative on their own. In the words of Massimo Vignelli, “I can write the word ‘dog’ with any type face and it doesn’t have to look like a dog, but there are people that think when you write the word ‘dog’—it should bark.” We hoped to offer a unique read or new insight into the themes of the show, and used this opportunity to highlight its alternative attributes. Knowing that the logo would most often be seen alongside promotional images for the show, we aimed for a solution that shifted emphasis onto the vibrancy of the works in the exhibition and that allowed the photographs to speak for themselves. As a result, the end product is devoid of any color at all. This choice also acts as a playful nod to color photography’s black-and-white roots. Visual tension and boxed-in type reference the inherent tensions present in the show, an array of conflicting ideologies, motivations, and viewpoints. The exhibition logo reaches its highest potential when used in promotional materials, sandwiched between images from the show. Milwaukee Art Museum promotions typically feature one image per piece to give museum-goers an idea of the work being exhibited. Color Rush posed a unique challenge: no one image can stand in as a representative for the show. The exhibition is comprised of seemingly disparate elements working together to give a near century-long account of color’s beginnings. 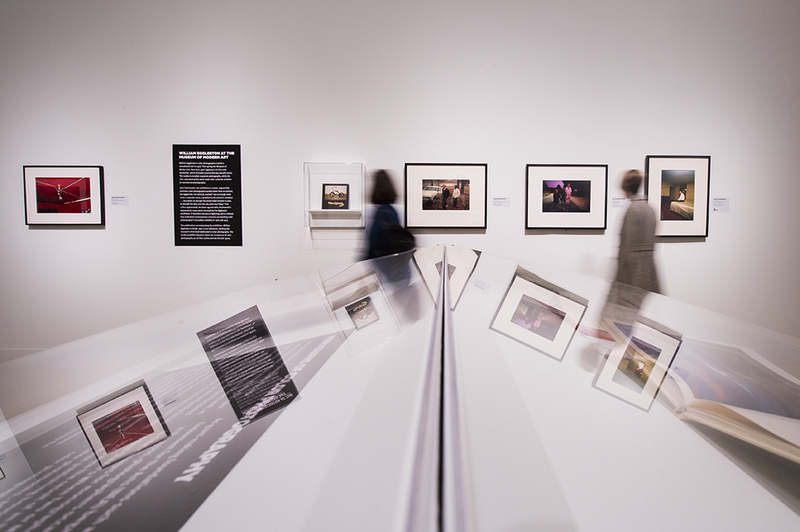 For this reason, we set about pairing images from the exhibition not normally seen in the same context in hopes of sparking interest and excitement about the range of work present in the show. A lot of time was spent narrowing down potential image pairings and juxtaposing varying genres, colors, eras, and themes. We worked hard to create the most unique and thought-provoking image combinations. After a thorough revision process, three official pairings were chosen for use throughout various promotional media. Next stop – outdoor signage! As opening day approached, we began meeting with the Museum’s exhibition designer David Russick to start designing the graphic elements in the show. 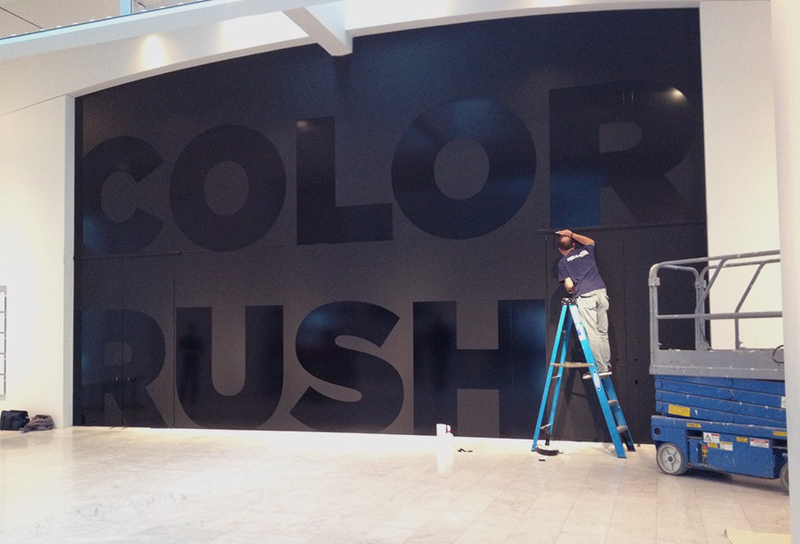 Everything from text panels to labels to directional signage is considered and designed with care, keeping the overall identity of Color Rush in mind. 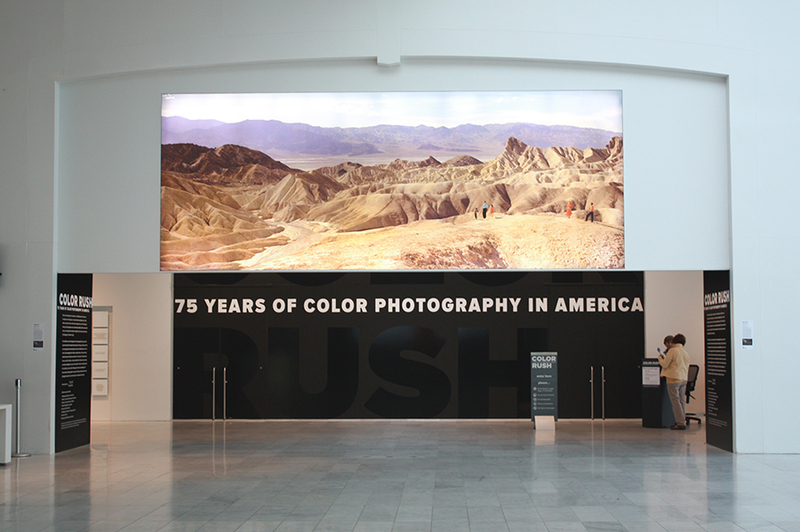 One of the biggest challenges for each show is designing the title wall, the first thing visitors see when entering an exhibition, and which typically exists on or behind the large glass wall that separates Windover Hall from the Baker/Rowland Galleries (our main exhibition space). Color Rush in particular posed some interesting limitations. 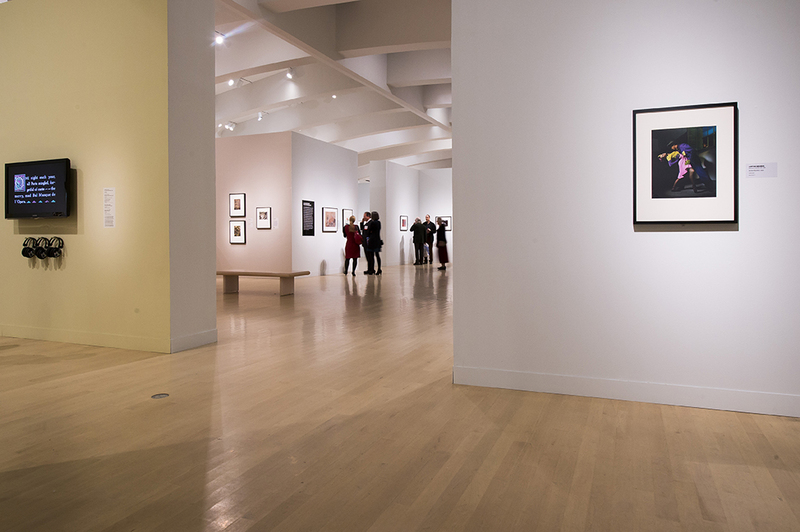 First – because many of the works in the show are sensitive to light, it was recommended that we cover up most, if not all, of the glass wall with black vinyl to protect the photographs inside. 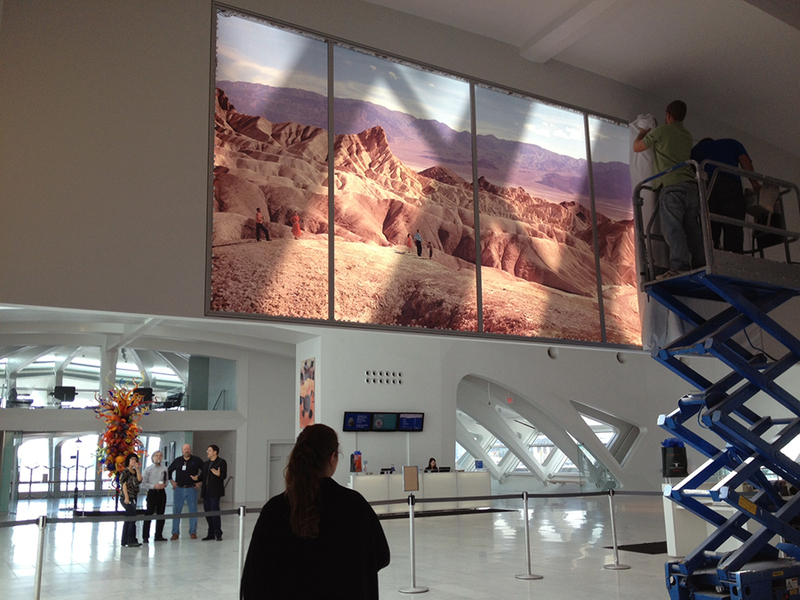 Second – we were installing a large-scale photo reproduction of an Ansel Adams photograph in between the hall and the galleries that would obstruct the view of almost half of the glass wall. It was crucial to ensure that our final solution didn’t compete with the Adams installation, yet would still be noticeable and legible enough to be recognized as the exhibition entrance. 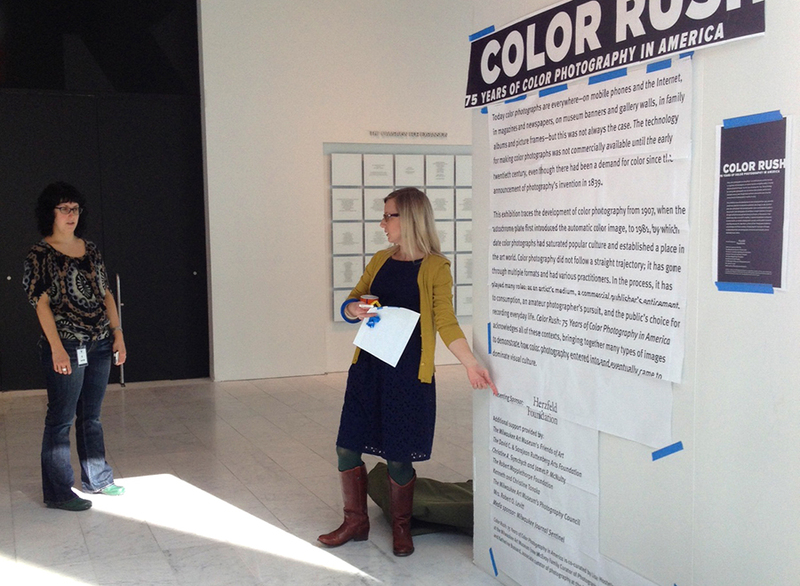 Since visitors coming to see Color Rush had likely already come in contact with some sort of advertisement or promotional material, we also knew how important it was to carry the brand over through familiar typeface, color, and layout choices. One of the characteristics from the brand we hoped to carry over into the title wall was the visual tension present in the logo. Our solution was to make the title big – really big. 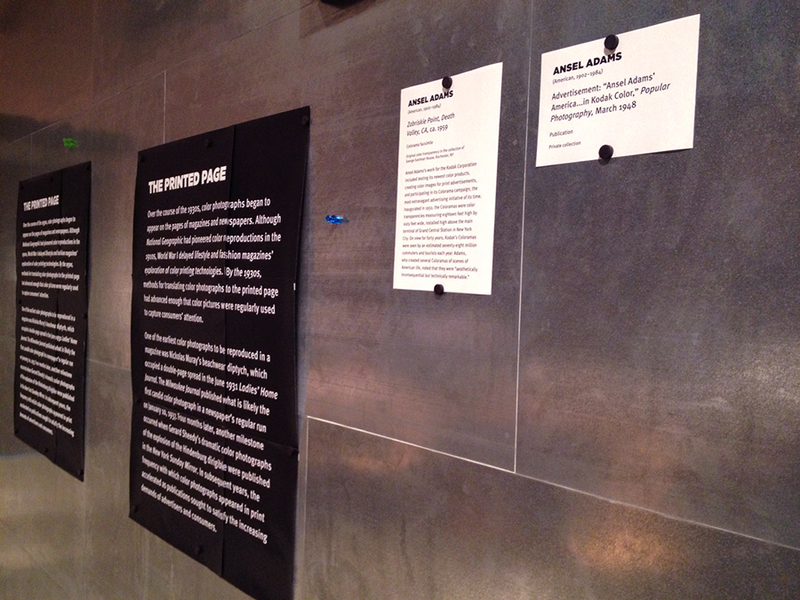 This choice also helped relate the Adams installation with the title wall through a common size relationship. An all-white title, as it exists in the logo, threatened to overpower the impact of the Adams piece, so we started experimenting with other color solutions. At some point in the process, someone threw out an idea from left field – what if the title were black text set on a black backdrop? Would it be legible? Would it stand out? Would it be memorable? If executed well, we knew the end result could be a visual treat. Not to mention, what could be more of a “color rush” than black? (When printed, black is the exhaustive combination of all color.) We contacted our sign vendor to see what our options were. Once we were confident in moving forward, we began installing the title wall. The final solution combined gloss and matte vinyl for a subtle yet legible black-on-black effect. We opted to leave the subtitle in white, a visual rhyme of the logos present on the introductory text panels beneath the Adams installation. The end result is a unique time- and space-based experience. Upon entering Windover Hall, visitors are first met with the enormous back-lit Adams installation. 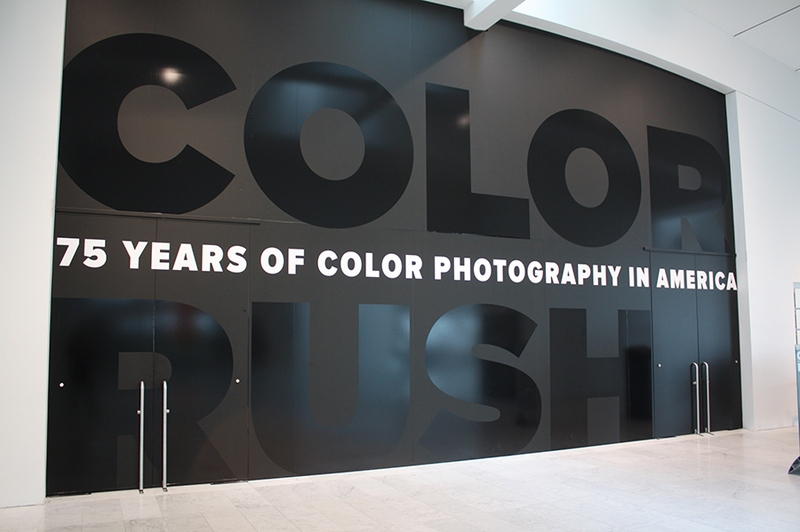 As they near the gallery entrance, the title wall is slowly revealed, until finally the exhibition’s full name is visible: Color Rush: 75 Years of Color Photography in America. This entry was posted in Behind the Scenes, Exhibitions and tagged advertising, color photography, Color Rush, graphic design. Bookmark the permalink. Thanks for this great post, Nate! 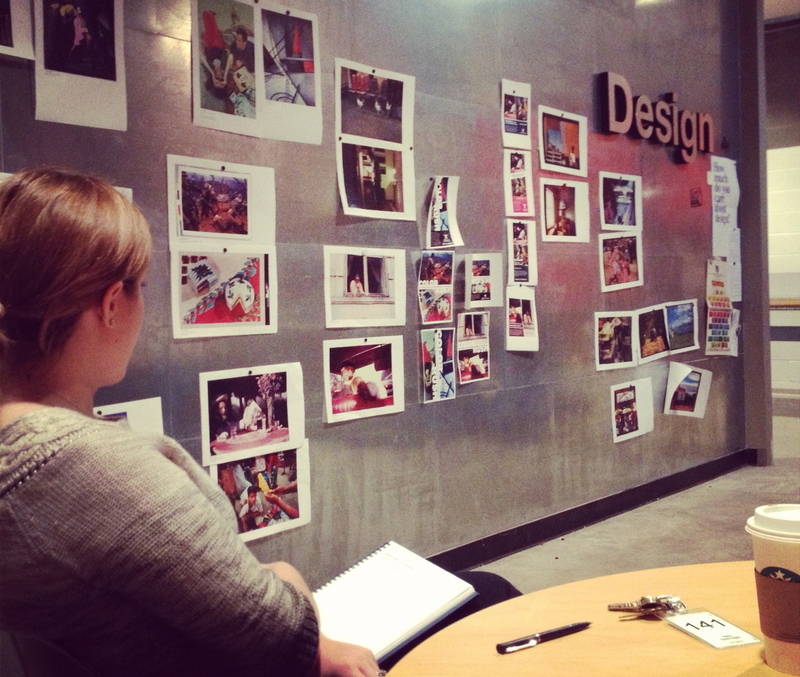 What a treat to learn all the discussion behind the design, and thank you for thoughtfully taking a photographic record of the process. We know how much time it takes to record your work as you DO your work. Awesome! Outstanding Show! The curator and designer did a wonderful job. To bring you up to date, maybe some hyper real HDR color street photography will be in the next color show that may add a few decades more history to this subject. But the future of museums and their print collection may be quite a bit different from the current state of being…at least when it comes to their photography collections. A lack of storage space and conservation expenses is a common thread with museums nowadays. I was wondering if a new approach would be of any help to this problem. Not being a curator myself, I may be overlooking some aspect of my idea that may not work. But I thought I would bring it up in any case for you to mull over. Would it be more conducive to a museum short of space and funds if photographers donated high resolution TIFF files of their images for a museum to care for in a digital collection? That way they should not be much of a concern with space limitations and conservation costs should not be that high. In my plan, a museum would have full rights to use the digital files to reproduce as prints for display or to use in publications in any aspect that a museum normally uses physical print donations. The digital images would be high grade scans of the negatives or exact copies of the full resolution digital files. Some photographers may not be as eager to give high resolution files. But the museums can put it out there and it may become a new trend and eventually the standard that museums must use if they would like to expand their collections, but have no room for new works.